Most diseases of outdoor shrubs cause little damage and are easy to control. Diseases are caused by bacteria or fungi, which require certain environmental conditions to grow. The bacteria or fungi often enter a plant through a wound caused by mechanical damage or pruning. Prevent or correct some diseases through proper cultural care, such as planting the shrub in the correct site, irrigating properly, and pruning during the right season. The only way to determine the exact cause of a shrub disease is to submit a sample of the infected plant material to a plant pathology lab. The staff at the local county extension office can help you collect and submit a sample. They can also give you information on how to treat a diseased shrub, once the disease has been identified. Some diseases can be treated with fungicides. Choose a fungicide approved for the type of shrub and the disease being treated. Apply the fungicide according to the manufacturer’s instructions. 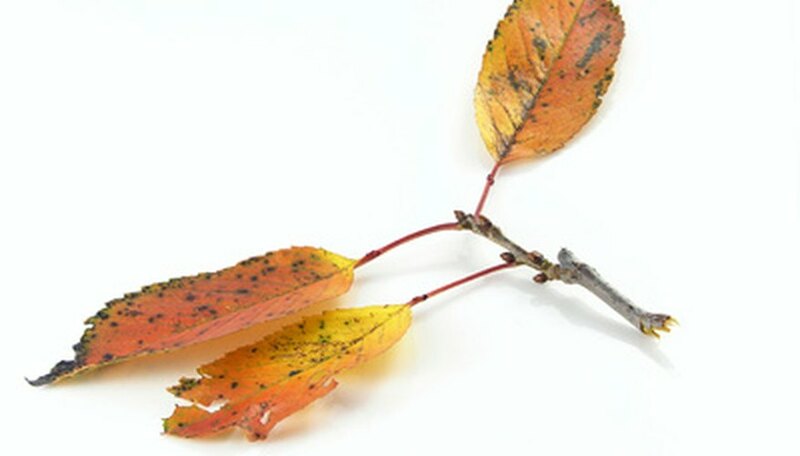 Numerous bacteria and fungi cause leaf spots on shrubs, which are unsightly but not usually fatal. The spots may have circular or irregular edges, and be reddish, orange, yellow or brown. Leaf spots are worse during humid conditions. Remove the infected leaves and destroy them. Some leaf spots can be treated with a fungicide. Sooty mold is a gray or black fuzzy mold that covers the leaves, stems, flower buds and fruit of shrubs. It is a fungus that grows on the honeydew secreted by some insects during hot, humid weather. It can be washed or rubbed off, or treated with a fungicide. Use an insecticide or other control method on the insects. Powdery mildew is a fungus that causes gray or dusty white patches on infected shrubs during hot, humid weather. It can completely cover affected leaves and stems if left untreated. This results in stunted or distorted growth, yellow leaves, and premature dropping of leaves, buds or fruit. Treat powdery mildew with a fungicide. Blights are caused by bacteria and infect the leaves, stems and flowers. The affected plant parts feel crispy and turn dark brown or black. In some cases, infected stems bend back on themselves in the shape of a shepherd’s hook. Shrub blights are common during prolonged periods of cool, wet conditions. Blighted plant material should be pruned out and destroyed. Cankers are dead areas of bark on the stems and branches of shrubs caused by injury, bacteria or fungi. The areas are usually round or oblong with raised edges. The tree tries to contain some infections by growing a ridge of healthy tissue around the canker. These cankers are usually not fatal. Other cankers ooze sap or fermented bacteria, and cause the tree to decline and die. Usually, there is no chemical or cultural treatment for cankers. Phytophthora fungus is the most common cause of root rot in shrubs. Verticillium wilt is a fungus that attacks the roots of shrubs and produces brown streaks in the sapwood. Infected shrubs usually decline and slowly die. In severe cases of infection, shrubs may die suddenly.